Home / Bill / К 80-летию Михаила Козинца: Лариса Симакович - "Скорина. Возвращение"
Mikhail Kozinets is the oldest working Belarusian symphony conductors. 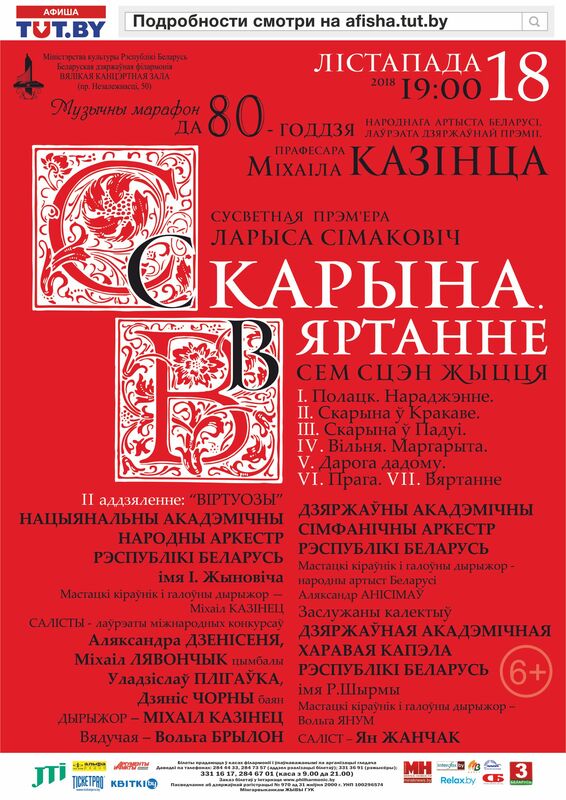 The People’s Artist of the Republic of Belarus, a laureate of State prize, Professor Mikhail Kozinets celebrates his 80th anniversary with a range of concerts that adorn the November playbill of the Belarusian State Philharmonic Society. They are united by the common name “Musical marathon of Mikhail Kozinets”. On 18 November will be arguably the most significant project of the musical epopee of Maestro Kozinets. Ever more than forty and a half years as a conductor, he was the first performer of dozens of new works by contemporary Belarusian composers. Many of these works were created and presented to the audience precisely thank him. So for his musical marathon, Mikhail Kozinets is preparing another premiere. This will be a new composition by Larisa Simakovich “SKORINA. RETURN” - seven scenes from of life of Francisk Skorina for a large symphony orchestra, choir and soloist. The composition will be performed by the State Academic Symphony Orchestra of the Republic of Belarus and the State Academic Choir of the Republic of Belarus n.a. G.Shirma. Soloist is Yann Zhanchak. The National Academic Folk Orchestra of Belarus named after I.Zhinovich, which Maestro Kozinets has been consistently headed since 1975, will take part in the second part of the concert. Outstanding virtuoso musicians, laureates and winners of numerous international competitions Mikhail Leonchik (dulcimer), Vladislav Pligovka and Denis Cherny (button accordion) will perform with this famous orchestra under the direction of Mikhail Kozinets. Information provided by the editorial department of the National Academic Folk Orchestra of the Republic of Belarus n.a. I.Zhinovich.